It’s funny how viewing an object can trigger long forgotten memories. Such is the case of the brutalist style wall hanging purchased recently for my vintage shop. Created by Finesse Originals during the 70s, it features a fiberglass rendering of a fisherman pulling his net from the water. The strong jagged lines of the fisherman along with the rugged and dark backdrop of the hanging brought be me back to my late teens where I often found myself immersed in the shadowy underworld of the drug culture. Images of a dragon ring that Lee had given to me as a present during one of my visits to his earthy smelling basement pad in order to score a fine grade of chocolate mescaline came to mind, images of something stark, foreboding and powerful. I sat on a chair peering at the dragon ring, a three dimensional pewter affair that had the usual gothic characteristics of a dragon with claws wrapped around a sand colored agate cabochon, but the band itself was different. It was molded with out of kilter hash marks that gripped either side of the dragon body. I didn’t realize at the time that this unique piece had clear markings of a brutalist design. It became a favorite piece of jewelry and I took it with me a couple of years later when I moved to Washington, D.C., where I eventually gave it to a lover who was leaving for Kuwait as a memento for our short lived but intense relationship. It was, I like to think, a brutalist affair. The ring and the Finesse Original were by products of a major architectural movement that began at the end of WWII in Europe as a result of cities and historical buildings being decimated by years of constant bombing and warfare. French architect Le Cobusier developed this style in the late 40s and Great Britain architects were eager to adapt the style as a cheap and innovative departure from previous designs. Other European countries followed. Considered a more severe form of Mid-Century Modern, early brutalist buildings became foils for the more fanciful Art Deco and earlier designs left standing. These stacked concrete monoliths seemingly from another world were criticized by many as lacking any sense of humanity, as big and ugly eyesores. Though it appeared to be an impersonal style of design, I believe brutalism was a direct result of a move toward the future away from the horrific events and destruction that had been a part of daily lives for so many. The ability to produce a bomb that could ultimately destroy earth coupled with Cold War ethics left behind much pre-war frivolous innocence. The large scale buildings represented modern day castles daring all to penetrate the fortress within. The look filtered on to movie sets and into innovative art and jewelry design. In the 1970s at the height of its popularity in the United States, sculptures by brutalist designer Jere could be found in just about any modern living room or office. 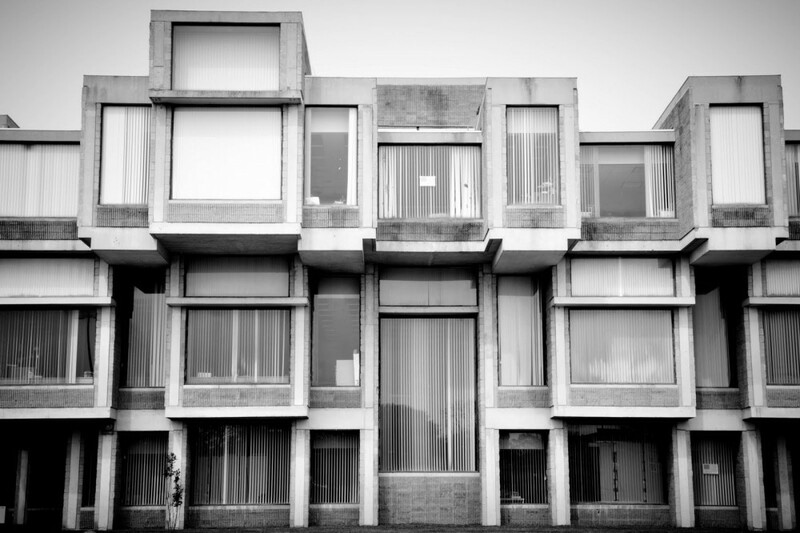 Whether or not one likes it, there’s something about a brutalist design that intrigues many an apt observer. I find the dark strength to these designs comforting and whenever I have the privilege of viewing them, I’m brought back to an earlier time, a time where I felt the power of a dragon wrapped around my finger.